Our next strong storm system and cold front are expected to impact the ArkLaTex late Friday into the upcoming weekend. We’re still expecting a round of rain and storms late Friday through Saturday morning ahead of an Arctic blast. Even though the threat is low, there is still the potential for a few strong to severe storms Friday evening into Friday night. As the rain moves out Saturday morning, much colder air will pour into the area. Temperatures are still expected to drop throughout the day on Saturday. Clouds will start to build back in during the overnight. Areas of fog will even be possible. Lows will range from the upper 30s north of I-30 to the mid to upper 40s south of I-20. Friday will be out last mild day before our temperatures will take a nose dive. Highs on Friday will range from the low 60s to near 70 degrees. Despite a mostly cloudy sky, most are going to stay dry throughout the day. The wind will also pick up out of the south at 10-20 mph Friday afternoon. Even though a few showers will be possible Friday afternoon, we won’t see an uptick in the rain and storm activity until Friday evening into Friday night. Rain and storms will drop from northwest to southeast across the area Friday night into Saturday morning. Most of the area will be under a Marginal Risk of severe weather Friday evening into Friday night, so a few of the stronger storms could produce severe hail and strong wind gusts. The threat of heavy rainfall and flooding has decreased. As the rain moves out Saturday morning much colder air and gusty northwest winds will pour into the ArkLaTex. 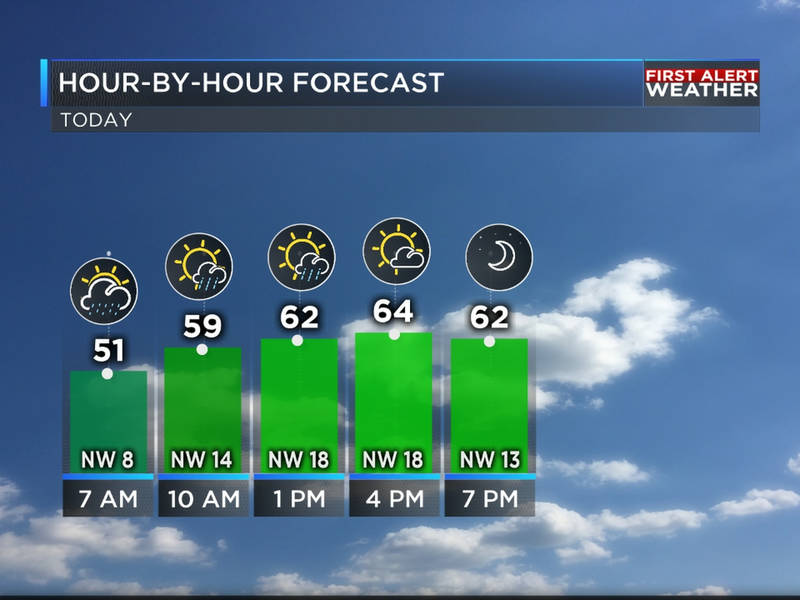 We’ll wake up to temperatures in the 50s Saturday morning. By the afternoon, most places will be dropping through the 40s and into the 30s. A north to northwest wind at 15-25 mph will put wind chills in the 20s and 30s area wide. Wind gusts Saturday morning into Saturday afternoon could be up to 40 mph. There is still the potential for light snow to mix in with or transition to all light snow late Saturday morning or Saturday afternoon across the I-30 corridor. No accumulations or travel impacts are expected. Temperatures will continue to tumble Saturday night into Sunday morning. Sunday morning will be bitterly cold. Temperatures will be in the 20s, but it’s going to feel even colder. Wind chills Sunday morning will be in the teens and twenties area wide. Despite a ton of sunshine, Sunday is going to be a cold day. Highs will only be near or just above 40 degrees. Temperatures will tumble below freezing again Sunday night into Monday morning. We’ll wake up to temperatures on Monday near or below 30 degrees. M.L.King Day will be sunny, but still chilly. Highs will only be near or just above 50 degrees. More wet weather will be possible Tuesday into Wednesday. Once again, it looks like a shot of cold air will move in after the rain is gone. Highs on Tuesday will be in the mid to upper 50s and only in the 40s on Wednesday.